Researchers with Berkeley Lab and the University of California (UC) Berkeley have created tactile sensors from composite films of carbon nanotubes and silver nanoparticles similar to the highly sensitive whiskers of cats and rats. The new “e-whiskers” respond to pressure as slight as a single Pascal, about the pressure exerted on a table surface by a dollar bill. Among their potential applications is giving robots new abilities to “see” and “feel” their surrounding environment. This is similar to the sensors used by certain mammals and insects to monitor wind and navigate around obstacles in tight spaces,” according to research team leader Ali Javey, a faculty scientist in Berkeley Lab’s Materials Sciences Division and a UC Berkeley professor of electrical engineering and computer science. Javey and his research group have been leaders in the development of e-skin and other flexible electronic devices that can interface with the environment. In this latest effort, they used a carbon nanotube paste to form an electrically conductive network matrix with excellent bendability. To this carbon nanotube matrix they loaded a thin film of silver nanoparticles that endowed the matrix with high sensitivity to mechanical strain. Javey notes that the use of elastic fibers with a small spring constant as the structural component of the whiskers provides large deflection and therefore high strain in response to the smallest applied pressures. As proof-of-concept, he and his research group successfully used their e-whiskers to demonstrate highly accurate 2D and 3D mapping of wind flow. In the future, e-whiskers could be used to mediate tactile sensing for the spatial mapping of nearby objects, and could also lead to wearable sensors for measuring heartbeat and pulse rate. This research, published in PNAS, was supported by the Defense Advanced Research Projects Agency. Mammalian whiskers present an important class of tactile sensors that complement the functionalities of skin for detecting wind with high sensitivity and navigation around local obstacles. Here, we report electronic whiskers based on highly tunable composite films of carbon nanotubes and silver nanoparticles that are patterned on high-aspect-ratio elastic fibers. The nanotubes form a conductive network matrix with excellent bendability, and nanoparticle loading enhances the conductivity and endows the composite with high strain sensitivity. The resistivity of the composites is highly sensitive to strain with a pressure sensitivity of up to ∼8%/Pa for the whiskers, which is >10× higher than all previously reported capacitive or resistive pressure sensors. It is notable that the resistivity and sensitivity of the composite films can be readily modulated by a few orders of magnitude by changing the composition ratio of the components, thereby allowing for exploration of whisker sensors with excellent performance. Systems consisting of whisker arrays are fabricated, and as a proof of concept, real-time two- and three-dimensional gas-flow mapping is demonstrated. 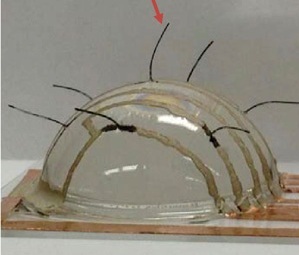 The ultrahigh sensitivity and ease of fabrication of the demonstrated whiskers may enable a wide range of applications in advanced robotics and human–machine interfacing.